You will only see a collection of art this incredible, free, in London. London’s National Gallery of art is simply AMAZING! They have them all, Van Gogh, Monet, Reubens, Stubbs, Titian, Botticelli, Van Dyke, Constable, Cezanne, Da Vinci, too many to list. Not just some lesser known work by the great artist, they have THE paintings, the most famous, impressive, sensational and valuable works, all there, for the public to enjoy and wonder at, just as it should be. See this list of 30 highlighted paintings from the gallery to give you an idea of what to expect. I have to say here that I am not an art buff. I never studied art and to this point in my life I’ve had very little interest in art ( other than Dali, who I adore) but being in London for the last few months, having access to the collection at The National Gallery and the differently amazing art at The Tate Modern( click through for our post on this art gallery for kids), has totally changed my outlook. I can’t get enough. This turn around is mostly down to my kids. I am responsible for their education, we travel full-time, they are homeschooled, so we learn about anything and everything when we get the chance. Learning about art, with them, using the amazing resources the London galleries and museums offer the public, often free, has turned me into an art lover. The kids are well on their way too. I would like my message to you to be, don’t brush off The National Gallery as “not your thing”, don’t think of art galleries for kids as “too boring and stuffy”, this one, in particular, isn’t. Go, enjoy and learn! The National Gallery stands magnificently at the back of Trafalgar Square, bang in the centre of London. The building opened as a custom-built gallery in 1838, it has always been free and has an ancient commitment to easy access for all social classes. To the left of the building above is the modern Sainsbury wing, the two are connected. Best Blog Read Now! Greenwich, London. Things to do, how to get there. 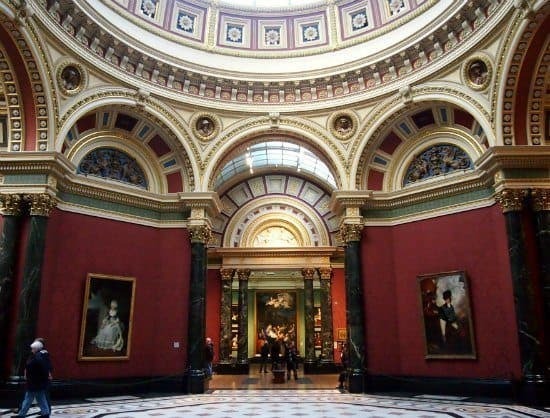 The gallery houses the British national collection of European paintings from the 13th to 19th century. Learning About Art at The National Gallery, For Kids and Adults. 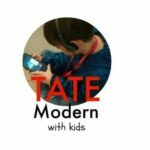 Art galleries for kids are so much easier when you combine great audio with the amazing visuals. This was our first experience of the gallery, we joined a free guided tour one day, just by chance, right place , right time. I wasn’t sure if it would be OK for the kids, these tours are mainly for adults, but it was a winner with my 10-year-old, the 8-year-old, less so, he switched off at the history of the gallery but he did find his new favourite painting, Rousseau’s Surprise!. Our guide showed us some of the gallery’s most definitive works, Botticelli, Van Gogh and everything in between. I learned a lot. 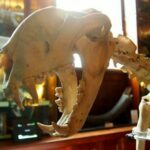 Free guided tours run every day at 11.30am and 2.30pm, they last about one hour. Audio Guides, for Kids and Adults. 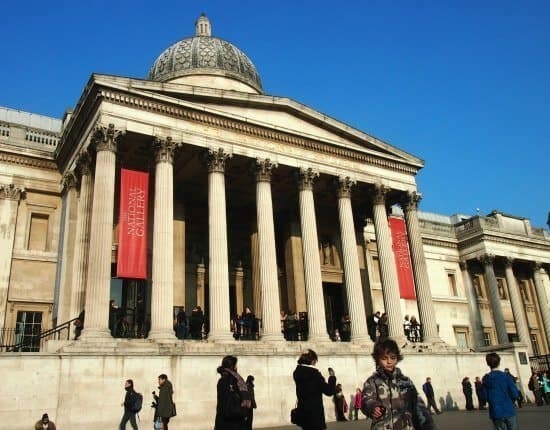 Rent an audio guide and you will get so much more out of your visit to the National Gallery. 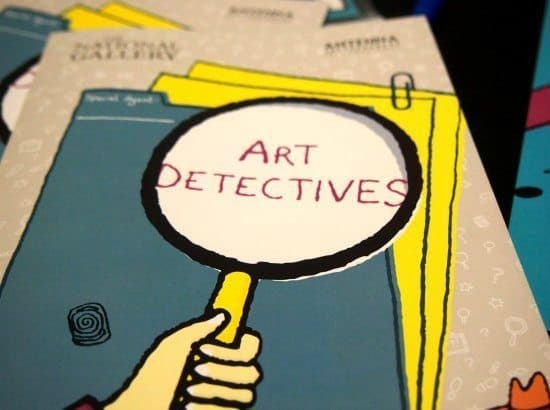 So far we have only tried one of the 3 kids’ audio tours available, Art Detectives, below. The leaflet presented us with 20 varied and well-known paintings, we found each one in its gallery and tapped the number on the page into the gizmo to hear an extremely kid-friendly description of what was going on. The narrative is funny, fast-paced, interesting and cool, it holds kids’ attention. Kids and adults will get loads out of this tour and spend time really looking at he paintings, noticing details and discovering their meanings. An added bonus, each painting in the gallery has an audio guide number on the wall, right next to it. If you tap that number into your hand-held gizmo, you can listen to the adult description too. This means that if any painting in the gallery catches your eye, or the kids’ eyes, you can stop and learn about it. My 10-year-old, who adores Greek and Roman mythology thanks to Percy Jackson, found dozens of paintings he wanted to explore. It cost us just £4 for our 3 audio guides, 2 free kids with each adult. That’s an incredible bargain. We found this particular audio tour very easy to negotiate, our most user-friendly so far. 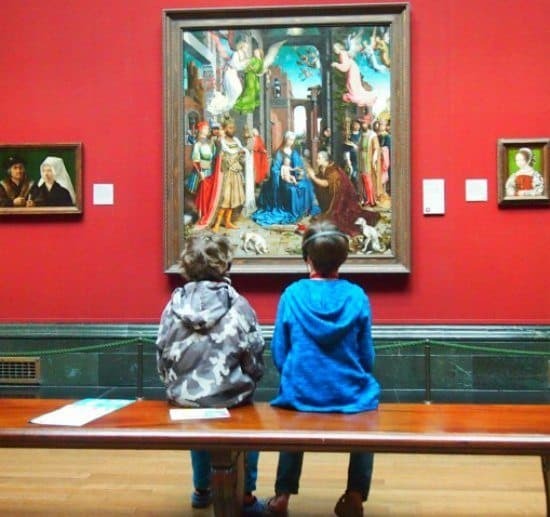 We only have a week left in London, but I hope we can squeeze in one more day at the National Gallery to try another kids tour, I checked with the boys, they’re keen. Drawing Classes, Family Activities, Workshops and Special Events. Free talk and draw sessions take place every Friday at 1pm. The museum provides all art materials. These sessions target adults but I have enquired, children are welcome. The range of activities on offer at the National Gallery is absolutely immense. 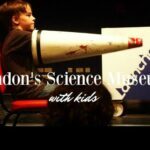 Modern museums in London are incredible resources for families and adults, offering weekend and school holiday classes. I can’t tell you all about them, just point you to the families section of the National Gallery website, booking is usually necessary to secure places. Everything you need for a family day out is here. We particularly enjoy the shop, it’s a great source of books, kits and art equipment. Most kids like shops, here they’ll be learning as they browse, why not take something home to encourage them even more? 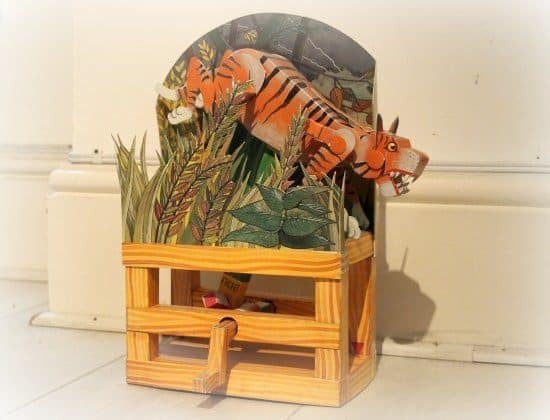 Here’s a kit we made earlier, Boo’s favourite painting again, the Rousseau. 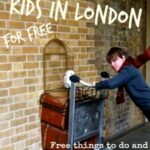 If you are looking for a hotel in London? Start your search here. Visiting London for the first time this summer and traveling with my 12 year old daughter. This informative article will be great for planning. Thanks! 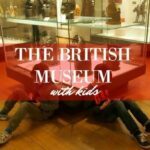 Thanks for this series on London museums. We’ll be referring to them in May when we are in London on our RTW trip! How will you tear yourselves away??? London rocks!! Love this! As always, thanks for sharing. Can’t wait for DD10 and I to do that audio tour and trails. Brilliant! It’s only OK to leave because we know we can come back any time Thursday. This is just too good.